An innovative initiative designed to revitalize vacant urban land will bring together leading forces in land conservation and urban land issues in northern Ohio and beyond. 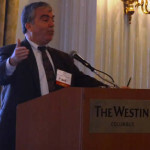 The not-for-profit Western Reserve Land Conservancy announced today that it will join with former Cuyahoga County Treasurer Jim Rokakis to create the Thriving Communities Institute, which will be devoted to facilitating the transformation of aging and declining urban areas through troubled mortgage and land vacancy mitigation, land conservation and land reuse in an intentional and integrated manner. By leveraging the Land Conservancy’s resources and Rokakis’ pioneering experience with an innovative land reutilization tool, the Institute will be able to take a regional approach to conservation planning that benefits its historic but distressed cities. “Our goal is to draw the silver lining out of the cloud of catastrophic land vacancy,” said Rich Cochran, president and chief executive officer of the Land Conservancy. “We see this as an opportunity to reinvent our cities through the reuse of their vacant land in ways that reflect how people live, play and work – now and for the rest of the 21st century. Rokakis will serve as director of the Institute, which will be a subsidiary of the Land Conservancy supported by corporate and philanthropic funding. 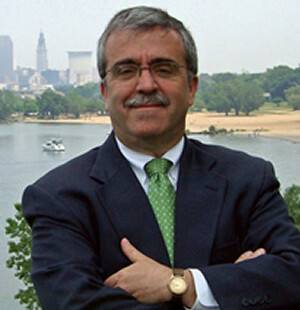 As county treasurer for nearly 14 years, Rokakis became nationally renowned for his work on urban housing and land issues and was instrumental in creating Cuyahoga County’s Foreclosure Protection Program. He also founded and chaired the Cuyahoga County Land Reutilization Corp. (commonly known as the County Land Bank), the first such entity created under a recent state law that provides for the establishment of land reutilization corporations (LRCs) – not-for-profit corporations to promote, develop, manage and facilitate the reclamation, holding, rehabilitation and reutilization of vacant, abandoned, tax-foreclosed and other real property. The Institute represents the first major urban initiative for the Land Conservancy, which was formed in 2006 by the merger of eight local land trusts and has preserved more than 370 properties and more than 23,000 acres in northern Ohio. The organization works with park systems, municipalities, farmers and other property owners to permanently protect land. 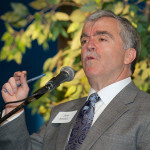 Cochran noted that before Rokakis led the creation of Ohio’s LRC land bank model, the Land Conservancy was unable to strategically engage in the region’s urban areas. Thus, its urban work to date has been limited to the creation of small urban parks and preserves. Now, with this innovative new tool, the Land Conservancy is able to invest significant resources in regional urban conservation planning as well as transactions to preserve urban land. “Urban land vacancy is a major problem but it also provides an opportunity to create new cities from the ashes of the old,” Cochran said. “When we utilize some of our vacant land to create beautiful natural amenities in urban areas, we create attractive regional communities, reduce pressure for urban sprawl, and serve the people of our region by providing them with a healthy and prosperous place to live and work. Rokakis said the LRC legislation allows for a well-funded and well-protected entity to acquire vacant land at a fast pace. In the LRC, the vacant land can safely sit with no taxes, no insurance, and no environmental liability until a discriminating plan is developed for the land. During this land accumulation phase, he said, the LRCs have the opportunity to engage in long-term master planning to create a system of natural resource amenities to provide “ribbons of green” woven throughout the entire community. Develop new strategies and tools to restructure large mortgage portfolios to prevent additional waves of devastating land vacancy in our cities. The Thriving Communities Institute will also be engaged in a national, yet to be formally announced, effort that will develop new approaches to preventing the continuation of the mortgage foreclosure crisis. This initiative of the Institute will endeavor to halt the spread of property vacancy in troubled communities by working with national and international financial institutions to prevent residential foreclosures. This will address the cause of land vacancy, a massive mortgage crisis, while the other efforts of the Institute will focus on improving the already existing effect, widespread vacancy. “We need to work toward a new model on foreclosure prevention—one that addresses mortgage modifications on a large scale basis if we are to have any hope of slowing the problem of foreclosures and homeowners who are simply walking away from their mortgages,” said Rokakis. At 22, Jim Rokakis was elected the youngest member of Cleveland City Council, where he served for over 19 years. He aggressively attacked neighborhood blight by cleaning up distressed areas of his ward, helped to spur the construction of over 200 new homes and created a new shopping center in the Brooklyn Centre community that provided vital services to that neighborhood. Jim worked tirelessly to improve the region, and it was his leadership that helped to redevelop Cleveland’s downtown. He was instrumental in key projects like the Gateway Sports Complex (home to the Cleveland Indians and Cleveland Cavaliers) and crafted the compromise that allowed construction of the internationally known Rock and Roll Hall of Fame and Museum. In 1997, Jim took office as Cuyahoga County Treasurer, bringing his innovative skills and passion for the community to a struggling county office. In the decade that followed, Jim overhauled the entire office and greatly enhanced the County’s existing tax collection system by instituting state-of-the-art billing and collection process and made property taxes easier for residents through Web-based property information and payment options. Jim’s activist approach didn’t stop with the day-to-day activities of the Treasurer’s office. In cases where he was unable to implement a program because it was beyond the scope provided by state law, Jim worked with legislators and leaders to develop and pass legislation that made them possible. His hands-on leadership served the County well and inspired the creation of many innovative programs to improve neighborhoods, communities and the entire region. Faced with Cuyahoga County’s mortgage foreclosure crisis, Jim helped to write and pass House Bill 294, which streamlines the foreclosure process for abandoned properties. Jim took the leadership role in creating the County’s “Don’t Borrow Trouble” mortgage foreclosure prevention program, which combats predatory lending and assists homeowners facing foreclosure. 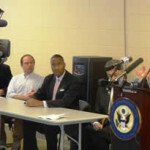 Over 4,000 homeowners have been saved from foreclosure as a result of this program. Jim also spearheaded the passage of legislation (SB 353), which created a new kind of land bank that keeps properties away from speculators and facilitates economic and neighborhood development. Additionally, Jim developed a program that uses the investment portfolio to purchase bonds from cities to help them deal with the costs associated with abandoned properties resulting from foreclosures.